drink and lodging with the comforts and modern conveniences of a grand hotel. A full service Middlebury VT hotel with 71 guestrooms, the Inn offers unparalleled food, drink and lodging with all of the comforts and modern conveniences travelers have come to expect. The Chef prides himself on the creative use of fresh ingredients as he prepares delicious dishes that are both satisfying and memorable. For Morgan’s Tavern, philosophy is that fresh is always best. All of food is cooked with the guest’s satisfaction in mind, to create a truly a memorable and satisfying dining experience. A fresh take on a historic public house, Morgan’s Tavern is the town’s gathering spot for locals and visitors. The menu ranges from traditional New England fare to creative fusions. A highly recommended historic Vermont Inn. 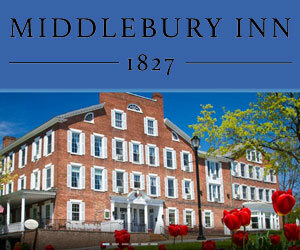 Ask us about Middlebury VT lodging or dining. If you would like to feature your Champlain Valley Vermont Country Inn, Lodge or Bed Breakfast Inn to this web site, please contact us.